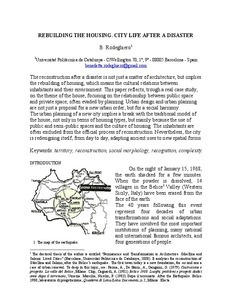 The reconstruction after a disaster is not just a matter of architecture, but implies the rebuilding of housing, which means the cultural relations between inhabitants and their environment. This paper reflects, trough a real case study, on the theme of the house, focusing on the relationship between public space and private space, often evaded by planning. Urban design and urban Planning are not just a proposal for a new urban order, but for a social harmony. The urban planning of a new city implies a break with the traditional model of the house, not only in terms of housing types, but mainly because the use of public and semi-public spaces and the culture of housing. The inhabitants are often excluded from the official process of reconstruction. Nevertheless, the cityis redesigning itself, from day to day, adapting ancient uses to new spatial forms. Rodeghiero, B. Rebuilding the housing: city life after a disaster. A: Eura Conference. "EURA Conference 2009 Proceedings". Madrid: 2009, p. 1-17.